As we all know Google and HTC working together and making two new Nexus devices this year. According to TechDroider, the image below is the first real photo of the HTC Marlin. While this should get a lot of Android fans quite excited, the photo itself is a bit of a disappointment. While we’d like to get a peek at the phone’s design, what we’re treated to is a device enclosed in a protective case and a photo that’s cropped closely around the phone’s display. 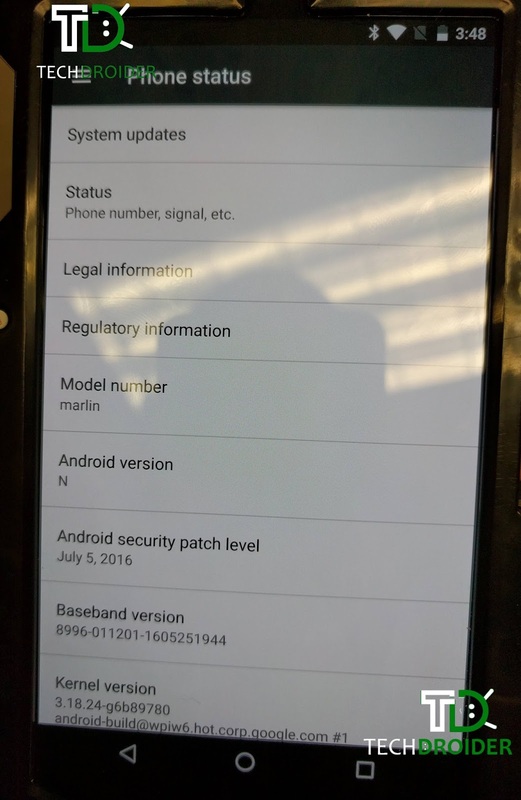 The only real information revealed by the photo is that the device is currently running on Android N with the latest July security patch installed. The source claims that the device in question features 128GB of internal storage, a metal body which resembles that of the HTC 10 and a fingerprint sensor located on the back. We don’t know when Google is planning to unveil its HTC-build Nexus phones. Since the Nexus 6P and Nexus 5X were officially shown off in late September of 2015, we may need to wait another 8 to 10 weeks. Are you willing to wait that long or are you planning to jump on the Note 7 when it hits store shelves after its August 2 launch date?